Ready for any weather: 5 essential Spring JacketsSalt Bae is making his UK debut with New RestaurantLondon’s first floating park has just been approved… and it comes with WiFi! Ted Baker has launched its latest Grooming Room, and it’s set sale in Canary Wharf. The popular chain is growing at a rapid pace, with the new Canary Wharf store marking their twelfth opening. This Grooming Room will pay homage to the ancient maritime roots of the area. Before sleek skyscrapers dominated the skyline, Canary Wharf was the largest shipping port in the world, importing the likes of fruit, sugar, wine and, of course, the wild canary birds which gave the once great dockland its name. So, it’s only fitting the style and layout of the venue fits, with glossy wooden flooring, plush armchairs and eclectic wallpaper. 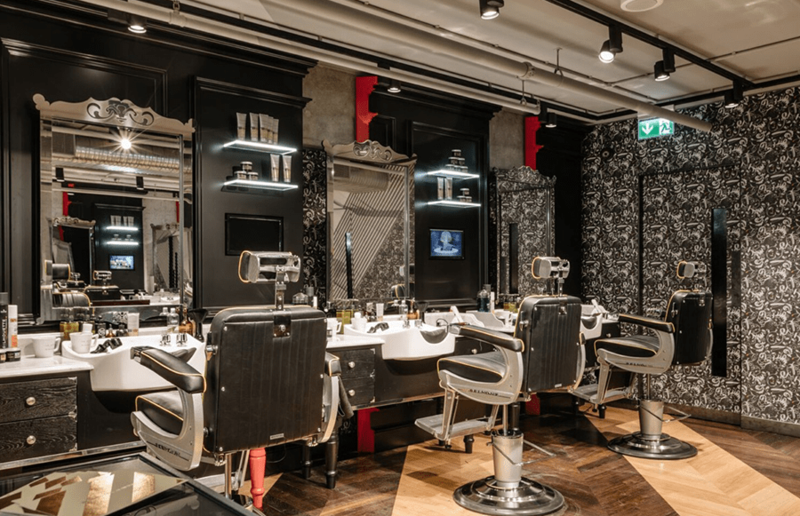 The store really does take inspiration from the area, with flashes of blue, black and yellow.There’s monochromatic paneling and marble work surfaces plus custom-made ‘barbicide’ lights and traditional barber poles. Once you get over the style and layout of the venue, there’s of course the menu of services on offer, too. 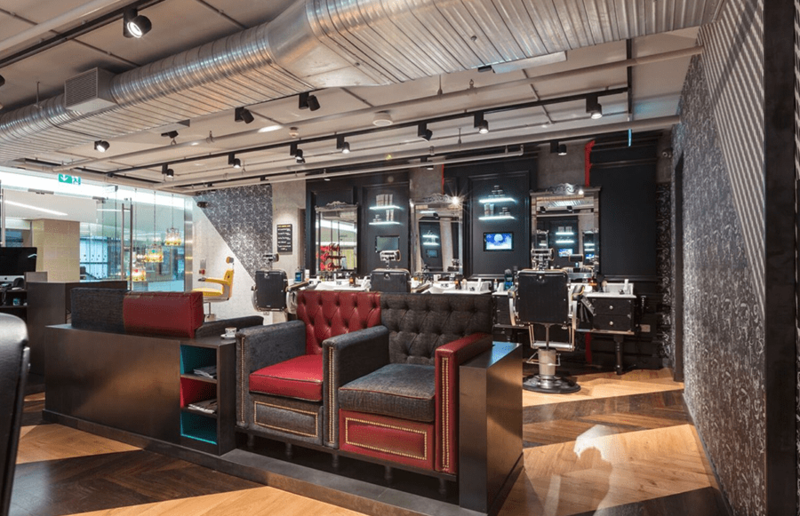 Canary Wharf will serve city workers with some of Ted’s classic treatments including the famous Tommy ‘n’ Turkish, The Full Ted Service, Cut a Long Story Short and Brow Threading for all walk-in customers. City slickers can ‘tweet’ themselves to a speedy shave or bespoke hair cut in time for that all-important engagement with the booking process made quick and easy with thought that those working in surrounding buildings need things fast! Once booked in, you can expect complimentary drinks for all customers, Ted’s Master Barber’s undivided attention and a relaxing, enjoyable top notch treatment! Perfect. Coming in at under £50 for a full haircut and shave, you can experience traditional Turkish barbering with a clean shave or beard design to complement your chosen hairstyle, rounded off with ear flaming as required. With a laid back atmosphere, friendly and talented staff its bound to be a hit with those city dwellers! 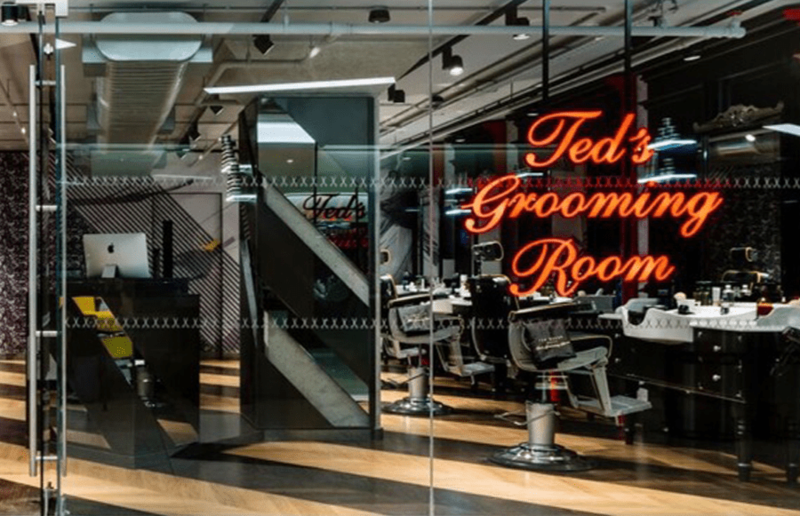 Ted Bakers Grooming Room is located within Churchill Place, Canary Wharf, E14 5RB. You can book via their website here.